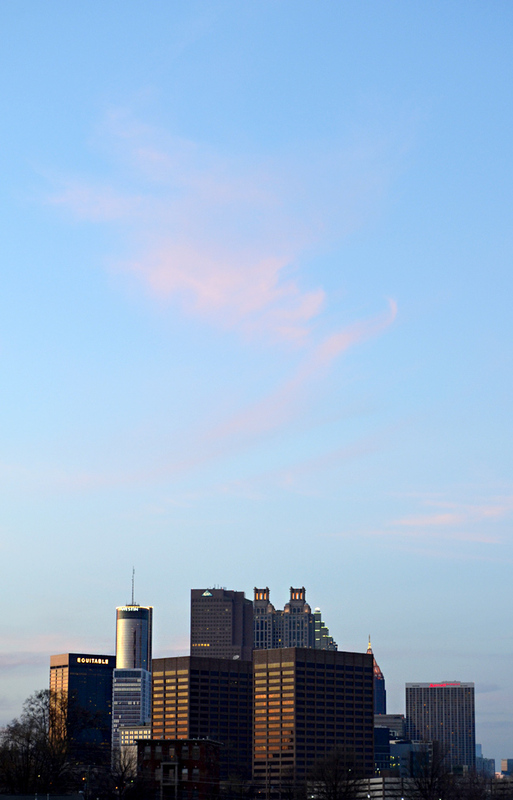 This particular shot was made in Summerhill, adjacent to Turner Field, just as sunset was approaching. The windows in the two buildings in the foreground are already turning a gorgeous copper color. Also in this shot, left to right, are the Equitable Building, the Westin Peachtree Plaza (72 story cylinder), the Georgia-Pacific Building (site of The Loewes Grand, where Gone With the Wind premiered), the 191 Tower (with the double open Gothic cupolas), the Suntrust Building peeking out, and the "pregnant" Marriott Marquis. Where ever your visiting in Atlanta, spy the skyline...you're most likely to see something you've never seen before...and even if you've seen a particular visita a bazillion times, check it out during the next sunset...if we have even a few clouds, you're guaranteed to see a sight that's as unique as every of our citizens. Now, go explore Atlanta...it's a gorgeous weekend!